While I was searching my local beer store for something new-to-me, I came across this trio of IPA's from Coronado Brewing Company. The brewery is located in . . . of all places . . . Coronado, California. Shocking, I know. The mermaid on the bottle grasping a mug a frothy beer is what initially caught my attention . . . after all, who doesn't love a drunken fish girl? Oh, come on, admit it, you do . . . we all do. Or maybe its just me . . . whatever. Anyhoo . . . being the hop loving, bitter beer guzzling chick that I am I felt compelled to give these fin tailed ladies a try. So I did. Hoppy Daze is a spring seasonal offering in the style of an unfiltered Belgian IPA. Brewed with Belgian yeast, it is a bit different than the IPAs I'm used to drinking. It pours a hazy golden color with a medium-ish white head. It is clearly unfiltered . . . I like that because it adds character to the beer. Immediately discernible are tropical fruits . . . pineapple especially . . . that are an interesting contrast to the bitter hops and the toasted malt. It's sweeter than I would generally prefer in an IPA but not bad. The hops lend a citrussy flavor that compliment the fruity sweetness and balances the whole thing out. Hoppy Daze finishes crisp and clean with a pleasant lingering bitterness. Islander IPA . . . wow! Good beer! It pours a rich golden color with a thick frothy head. It's got plenty of that grapefruity, piney hoppiness that I love so much with a touch of tropical fruitiness that is simply complimentary without a lot of overt sweetness. But what stood out the most was a wonderful caramel flavor that made Islander oh-my-goodness yummy! It's a fairly strong beer, 7% ABV. There is a noticeable boozy quality that doesn't detract from the beer at all, but it is clearly there. It finishes light with a touch of bitterness . . . mmmm, makes me want to go for more. Overall, this was my favorite of the bunch . . . this mermaid has it all going on. Really and truly quite delicious. Last but not least is the Idiot IPA . . . it's okay, I've been called an idiot a time or two. This one is an Imperial IPA and it's a big beer . . . as an Imperial style beer should be (8.5% ABV). It's strong, it's hoppy and it's gosh-darned good. 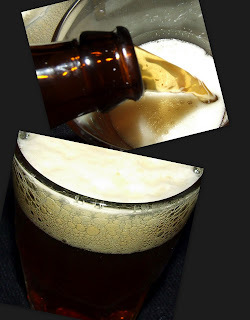 It pours amber with a white frothy head. I was immediately struck by a wonderful piney grapefruity aroma . . . I love that! If you like hops, then this is it . . . plenty of bitter hops with some citrus fruit and earthy spice and balanced by a mellow sweet maltiness. It finishes crisp with a touch of bitterness that is quite nice. Very will done . . . not too bitter, not too sweet . . . a very good, strong Imperial IPA. 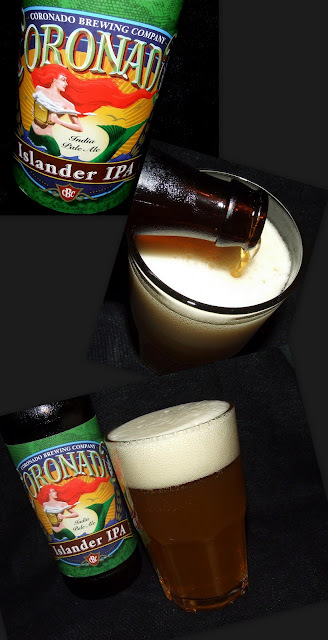 Three cheers for Coronado Brewing Company! I look forward to trying their other beers. YUM! Visit Coronado Brewing Company's website or check them out on Facebook!